Back to some electric piano love. It's been a long time since the last Rhodes compilation, so here's a banging collection of funky, jazzy, 70s latin tracks for your listening pleasure! 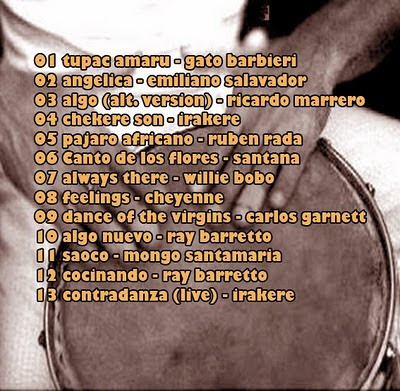 This is also in celebration of the completion of the Mongo Santamaria discography. Anyway ... the tracklist is on the back cover above, check the previews, and hope you enjoy it. Whoa, thanks Simon. I've picked up all your Rhodes comps in the past and this is much appreciated. Some around @ ebay too .... should grab one myself .. I really enjoy your posts and have been looking forward to another volume of Latin Rhodes. My complaint is about the artwork. It looks a little fuzzy after printing. I'd like to see the resolution raised to 100 or 200 DPI. My solution was to put low resolution pics up on my site to save storage space and use better pics in the downloads. Thank you X 1.000.000 for all the beautiful music and all the info! I'm thinking of a way to return the favor but I'm still blank... Will get back 2 u though!!! A Big THANKS & Keep Up Your Excellent Work.THANK YOU Again!!! sorry have you Simon 666 this album ? Word. Always enjoy the comps you put together here. Thanks. Just right for chillin whilst enjoying the great weather we have here in the UK at the moment. Nice one Simon, one can never get enough rhodes. Glad you're enjoying it guys. ... and Alessandro, sorry I don't have those ...had a look around and they seem to have been struck down by the Bl*ck J*zz curse , just not around. YAY! 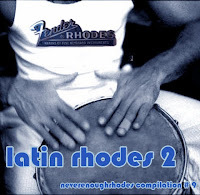 Another Never Enough Rhodes mix. Thanks Simon, glad to listen to another one. Much love. very nice, looking forward to this. (I think I paid $2 for it, by the way, and not 30 Euro...) and it is definitely mid-60s boogaloo and Latin Jazz all the way. Is the other one just a late-70s reissue with a dif. cover? I can't locate the pics I took of mine to compare the track listing, at least not at the moment. 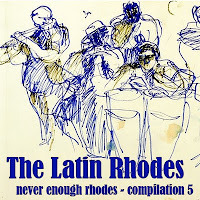 Great Blog, I have all Rhodes compilations, and i have a question, how i can contact you? I would like to share a LP with you,and also if you could post it in your blog. Cheers from Chile ..and sorry about my english. Temporary glitch on comment publication seems to have gone . Contradanza. Reminds me of Alan Zavod... has anyone heard his Rhodes solo on Maynard Ferguson's version of La Fiesta (Chameleon)? Awesome player.